I believe it is wise from an environmental and economic viewpoint to invest in renewable energy projects. I believe the costs of fossil fuel based energy will continue to increase. Renewable energy is continuing to improve and when considering the negative externalities caused by oil, gas and coal and the continuing improvement in wind, solar and geothermal generation investment in renewable energy are going to payoff well for countries. The largest increases in renewable energy capacity by country from 2005 to 2010 are: China (up 106%), South Korea (up 88%), Turkey (up 85%), Germany (up 67%), Italy and Japan (up 45%). All the data is from the Pew Clean Engery Program report: Who’s Winning the Clean Energy Race? (pdf). In 2010, [China] accounted for almost 50 percent of global clean energy superpower. The nation’s all manufacturing of solar modules and wind ascendance has been steady and steep. In turbines. China’s installation of less than 1 GW of 2005, China attracted less than $3 billion worth of private investments in clean energy. In 2009, solar energy capacity demonstrates that most of its production is for export markets. In contrast, 17 GW of wind energy was installed in China in 2010 helping the nation move quickly toward its 2020 target for installing 150 GW of wind. In fact, China accounted for 47 percent of all wind energy investments globally, with $45 billion tallied. Similarly, China led the world in asset financing, with $47.3 billion in private investments directed toward installation of clean energy generating capacity. India is poised to take a leadership role in the solar sector, with a target of deploying 20 GW by 2020. In 2010, the country set about getting its National Solar Mission in place by permitting 0.5 GW worth of large solar thermal capacity and a modest 150 MW worth of photovoltaic (PV) solar. My guess is that the stimulus packages in several countries contributed greatly to the increases (notably Germany and Italy targeted green investments – as did China to some extent, in Wind Energy). Spain took a hit as debt levels caused the government to cut spending. I would imagine this is likely to happen in Italy (and was expected to happen in Germany – the extent of decreases is less certain after the earthquake in Japan). Earning more is an important and simple idea that is ignored far to often. Simple, doesn’t mean, easy, just easy to understand. This is something people should definitely consider in their personal financial planning. There is a important caveat to remember, people earning a lot of money often have large financial problems and go bankrupt. Earning more if you borrow more than you earn and rely on ever increasing earnings can make you even more venerable than those earning less. A significant factor is how likely you are to replace your current earning if you need to find a new job. There is also another concern to watch for – don’t become a slave to your desire to earn more. The reason to earn more is to improve your life long situation. If you sacrifice what you enjoy too much it becomes a bad trade off. Short term sacrifices may well be wise. But many people find themselves in decades long sacrifices to try and get ahead. This isn’t a good plan. Making money online can be enjoyable and rewarding. However, it isn’t easy. I am putting more effort into this area and will be doing a great deal more in the next year. We will see how successful I am. 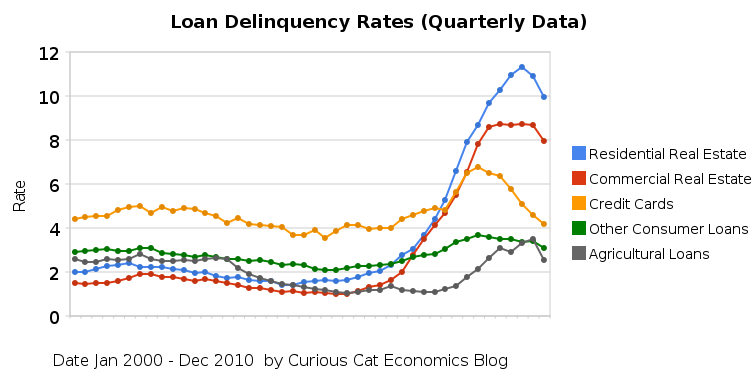 The second half of 2010 saw real estate, agricultural, credit card and other loan delinquencies decrease. The rates are still quite high but at least are moving in the right direction. Residential real estate delinquencies decreased 138 basis points in the second half of 2010, to 9.94%, which brought them to just below the rate at the end of 2009. In the second half of 2010, commercial real estate delinquencies decreased 77 basis points to 7.97% (which was also exactly 77 basis points less than at the end of 2009. Agricultural loan delinquencies decreased 76 basis points, to 2.55% (down 53 basis points from the end of 2009). Consumer loan delinquencies decreased, with credit card delinquencies down 90 basis points to 4.17% and other consumer loan delinquencies down 27 basis points to 3.1%. The credit card delinquency rate decreased a very impressive 219 basis points in 210. For 2010 and 2011, the most that an individual can contribute to a traditional IRA or Roth IRA generally is the smaller of: $5,000 ($6,000 if the individual is age 50 or older), or the individual’s taxable compensation for the year. You have until your taxes are due (April 15th, 2011) to add to your IRA for 2010. An individual who is age 70Â½ or older cannot make regular contributions to a traditional IRA (just to make things complicated you can add to a Roth IRA) for the year. More details from the IRS website and earning limits details. The income limits do not cap what you can add using a 401(k). So if you were planning on adding to a Roth IRA but cannot due to the income limits you may want to look into increasing your 401(k) contributions. 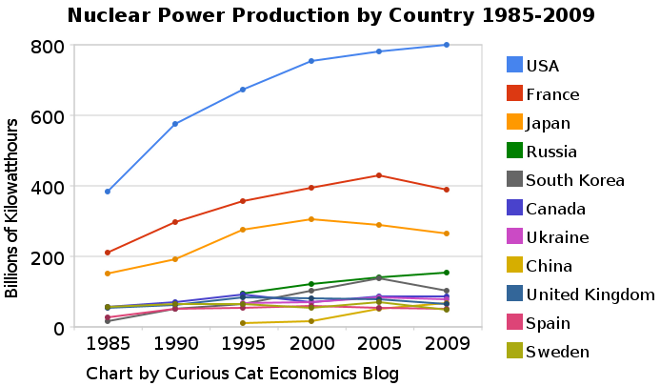 The chart shows the leading nuclear power producing countries from 1985-2009. The chart created by Curious Cat Investing and Economics Blog may be used with attribution. Data from US Department of Energy. Nuclear power provided 14% of the world’s electricity in 2009. Wind power capacity increased 170% Worldwide from 2005-2009, to a total of 2% of electricity used (38,025 Megawatts of capacity). The USA produced nearly twice as much electricity using nuclear power than any other country, which surprised me. Another view of data on nuclear power shows which of the leading nuclear producing countries have the largest percentages of their electrical generating capacity provided by nuclear power plants (as of 2009). France has 75% of all electricity generated from nuclear power. Ukraine had the second largest percentage at 49%, then Sweden at 37% and South Korea at 35%. Japan is at 28% compared to 20% for the USA (I am surprised these are so close _ would have thought France and Japan would be much closer). Russia is at 18% and China was at just 2%. As of January 2011, 29 countries worldwide are operating 442 nuclear reactors for electricity generation and 65 new nuclear plants are under construction in 15 countries. Source, Nuclear Energy Institute. From 1985 to 2009, USA production increased 108%, France 84% and Japan up 77%. South Korea is up 550% (from a very low starting point). Globally nuclear power production increased 80% from 1985 to 2009. From 2000-2009 production increased 5% in the USA and decreased by 1% in France and 13% in Japan. China was up 318% (from a very low level) from 2000-2009 (they did not have nuclear power capacity prior to 1995. The global capacity of nuclear power was scheduled to increase more rapidly in the future before the earthquake in Japan and the crisis at the Kashiwazaki-Kariwa Nuclear Power Plant. China was going to add a great deal of capacity and is likely to over the next few years (nuclear power plants take many year to bring online so those coming online in the next few years have already had hundreds of millions invested in building them). Several European countries have already announced temporary closing of some plants (especially some plants nearing the end of their originally scheduled lives – which those countries had been in the process of extending). As a comparison global oil production increased by 10.5% from 1999-2009, while nuclear global production increased by 5% from 2000-2009. 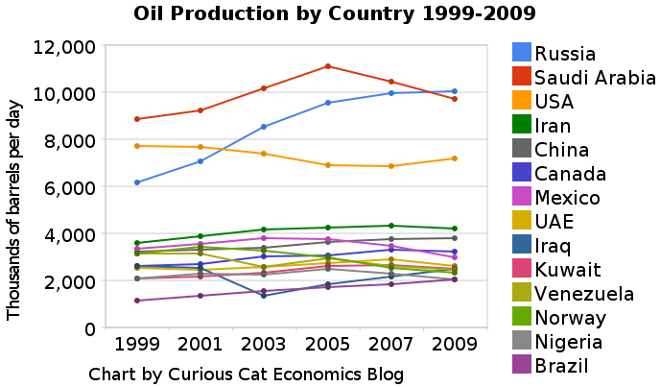 From 1999-2009 USA oil production decreased 7%. Russia increased production 62% in the decade, moving it into first place ahead of Saudi Arabia that increased production 10%. Bill Gates is really doing some great stuff the last few years. He takes a look at the enormous problem with state government’s failure do deal with the very long term health care failure in the USA (this has been going on for the last few decades) and the financial games them play. His Twitter quote is: Enron would blush at the financial untruth State governments engage in. I have written about these problems before, including in: USA State Governments Have $1,000,000,000,000 in Unfunded Retirement Obligations. One small (compared to the problem for the whole country) He notes is that California has a $62.5 billion health care liability and $3 billion set aside for it. We have been doing a very bad job of electing people to honest manage budgets. We, or our children and grandchildren are going to pay for those failures. The longer we fail to elect people that will deal with the real decisions that need to be made for government spending and taxing the greater those bills for our mistakes will be. Nonfarm payroll employment increased by 192,000 in February, and the unemployment rate decreased to 8.9%, the U.S. Bureau of Labor Statistics reported today. Job gains occurred in manufacturing, construction, professional and business services, health care and transportation. Revisions also added 58,000 jobs added in the previous two months. The change in total nonfarm payroll employment for December was revised from +121,000 to +152,000, and the change for January was revised from +36,000 to +63,000. The job gains are good news, but job growth has to sustain gains over 175,000 a month for at least 6 months (and gains over 250,000 would be much better) to begin to make a serious dent in the millions of jobs lost in the recession (weather likely restrained January job growth that showed up in the February figures if you take the average for the 2 months you get a gain of 127,500 jobs a month). Since a recent low in February 2010, total payroll employment has grown by 1.3 million, or an average of 106,000 per month. Approximately 125,000 jobs have to be added just to keep up with growth in the population. Until we are consistently adding 230,000+ jobs a months the employment picture is not improving strongly enough given the large number of recent job losses. Adding over 150,000 jobs a month is good, but more is needed to provide jobs for the large number of unemployed. The number of long-term unemployed (those jobless for 27 weeks or more) was 6.0 million and accounted for 43.9% of the unemployed. Decreasing the number of long term unemployed is a key measure, as significant gains are made it is a sign pointing to better economic conditions. Manufacturing employment rose by 33,000 in February. Almost all of the gain occurred in durable goods industries, including machinery (+9,000) and fabricated metal products (+7,000). Manufacturing has added 195,000 jobs since its most recent trough in December 2009; durable goods manufacturing added 233,000 jobs during this period. Construction employment grew by 33,000 in February, following a decline of 22,000 in January that may have reflected severe winter weather. Within construction, specialty trade contractors accounted for the bulk of the February job gain (+28,000). Welcome to the Curious Cat Investing and Economics Carnival: find useful recent personal finance, investing and economics blog posts and articles. Investment Risk Matters Most as Part of a Portfolio, Rather than in Isolation by John Hunter – “It is not less risky to have your entire retirement in treasury bills than to have a portfolio of stocks, bonds, international stocks, treasury bills, REITs… This is because their are not just risk of an investment declining in value. There are inflation risks, taxation risks…” (including structural imbalances introduced by the Feb depressing short term yields to provide billions to large banks from the pockets of savers).